Life insurer Prudential has agreed to buy the 21.7% stake in internet bank Egg it does not already own. The deal values Egg shares at 118 pence each, giving the bank a value of about £973m ($1.68bn). Prudential announced in October that it was to hang on to its majority stake in Egg following an unsuccessful attempt to sell the holding. 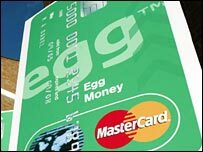 Egg, which employs about 2,500 people, was set up by Prudential in 1998, with its shares being floated in 2000. Prudential is offering Egg shareholders 0.2237 new Prudential shares for each Egg share. This values each Egg share at 118 pence, a 15% premium to Wednesday's closing price. Prudential said it intended to set up a free share-dealing facility for Egg shareholders in the UK who accepted the offer. The facility will allow people to sell up to 300 Prudential shares without incurring costs. Egg's performance has improved recently, following an unsuccessful attempt to break into the French market. In October, it reported operating profits for the third quarter of £17.9m, a £4m rise on the same period a year before. Prudential said the deal should allow it to make cost savings of £40m by the end of 2007. "The combined strength of our Prudential UK, [fund manager] M&G and Egg businesses provides the group with significantly greater opportunities across the spectrum of personal financial services in the UK than is available to them operating in isolation," said Prudential's chief executive Mark Tucker. Egg's chief executive Paul Gratton said he looked forward to "developing the Egg brand and proposition as an integral part of Prudential's UK business". "There are considerable opportunities to grow Egg's revenues and profits within the Prudential Group, which will give us access to nearly 2.8 million additional marketable customers," Mr Gratton added.